The political crisis in Italy makes global investors panicked. Stock markets around the world fell on Tuesday (29/5) and investors demanded high yields on Italian government bonds. Italian stocks fell another 3 percent, accumulating declines this week. Banking stocks were hardest hit, some of them down even more than five per cent. In addition to the Italian stock exchange, the CAC 40 index in France fell 1.29 percent, the DAX index in Germany fell 1.53 percent, and the AEX index in the Netherlands fell 0.91 percent. Not only impact on the Continent, Wall Street stock also hit. 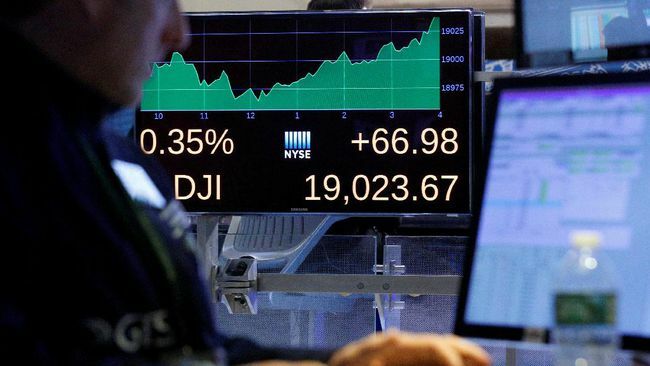 The Dow Jones index is down 1.6 percent or around 392 points, while the S & P 500 and Nasdaq slip by 1.1 percent and 0.5 percent respectively. Quoted from CNN, investors are worried the new elections (elections) in Italy will end up chaotic and affect the surrounding country. Such concerns caused Spanish, Portuguese and Greek debt yields to soar. Italy is heading for a new election after populist politicians fail to form a government. Radical parties could gain more ground, and investors feared that the vote would turn into a de facto referendum against the euro. Some market analysts fear Italy will eventually get out of the European Union, a scenario they call "Italexit" or "Quitaly". One big risk is that Italian politicians will likely stop following the euro rule or no longer use the currency. The euro fell 1 percent against the dollar Tuesday, reflecting investors' concerns. "The real euro crisis is the worst scenario," said Florian Hense, an economist at Berenberg Bank. Italy is the third largest economy in the euro zone, accounting for 15 percent of the Gross Domestic Product (GDP) in the region. It is much bigger than Greece, the source of the recent eurozone crisis. Despite the risks, analysts see little chance of Italy leaving the euro. However, increased spending by the new Italian government could increase market tensions. Years of stagnation and lack of reform have pushed Italian government debt to above 2 trillion euros (exchange rate of Rp16 thousand per euro), equivalent to more than 130 per cent of the country's GDP. It is the third highest debt level in the world after Japan and Greece. Moody's rating agency over the weekend has cut Italy's debt rating. The majority of Italian government debt is owned by Italians, but the European Central Bank also has a large share, along with banks and investors in France, Luxembourg, Germany and Spain. 0 Response to "Italy's Political Crisis Makes Global Stock Exchange Rile"